The dinner’s very low-key menu and place setting. On Tuesday night, President Trump hosted the first state dinner of his presidency, a soiree honoring conservative French president Emmanuel Macron and his wife, Brigitte. The meal began with a salad featuring young lettuce and biscuit “crumbles,” followed by a fancy rack of spring lamb and a side of New Orleanian jambalaya prepared with Carolina Gold rice. 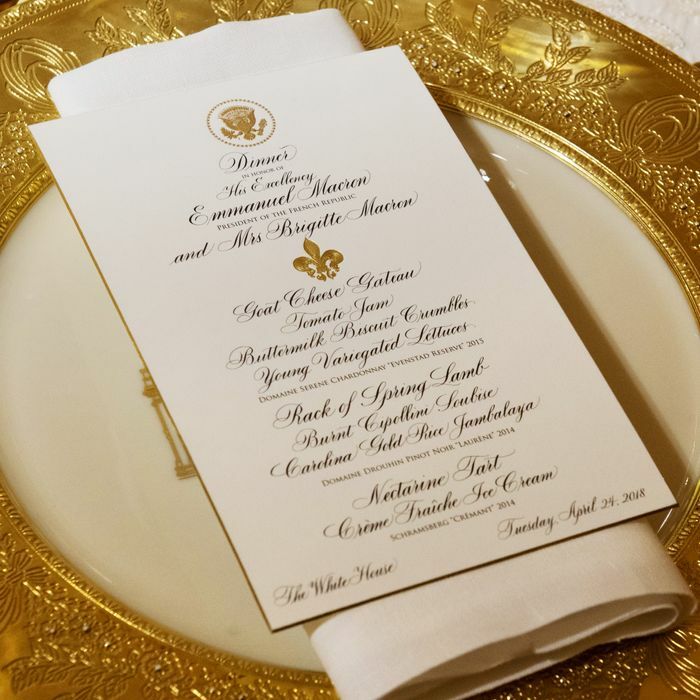 A source tells me the “jambalaya” served at White House state dinner last night was “just rice” — seasoned but no seafood, meat (or tomatoes). “Rice pilaf!” Isn’t there, like, a line in the Louisiana Purchase Treaty forbidding that stuff in the South?